Fans of World Wrestling Entertainment have been treated well in terms of releases in the past decade as each year, we see a brand new title come out that always promises to be bigger and better than it’s predecessor. THQ have been delivering the goods for over 11 years now and I can definitely say there have been some absolute masterpieces to come out of the prestigious “Smackdown” series. If you need proof on that statement, just look at Smackdown 2 or Here Comes the Pain, both of which completely shook ground on their platform and delivered just about everything a fan could want. They were simple, true to the sport, and most of all…fun. Unfortunately, that is all in the past now as the last few titles in the franchise have been taking more steps back than forward. 2011 is a whole new year though. No longer donning the “Smackdown vs Raw” name, WWE ’12 is THQ’s fresh take on the series. Featuring a new control scheme, new gameplay mechanics, a brand new Road to Wrestlemania Mode, and a healthy array of customization, this is supposed to be the wrestling game that changes it all. “Bigger, Badder, Better” was even the catchphrase used to promote the game. After foaming at the mouth for months just to see what this offering would bring, I finally got to get my hands on this reboot. Sadly, I feel like I need some soap as this may in fact be the worst wrestling title to ever grace a console. Why do I say that? Here is my review for WWE ’12. For the past few years, Road to Wrestlemania has taken over the standard “Season” mode where the player was allowed to choose one of five Superstars and then go through a WWE calender year, performing in matches while getting fed plots and feuds along the way. 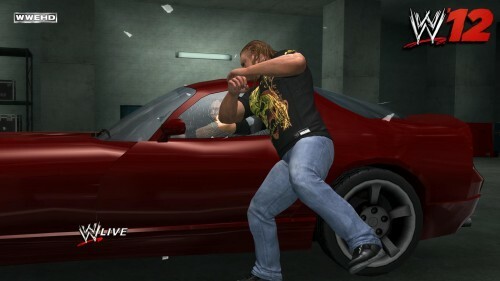 WWE ’12 utilizes that same formula this time around, but now everything is much more limited. Instead of actually selecting your favorite Superstar, the player starts off playing as Sheamus, then switching to Triple H, and finally getting to embody your own creation…by the name of Jacob Cass. Each week you will take your assigned Superstar into a match, with new feuds and scenarios thrown in at random to build up hype for the next Pay-Per-View. As far as a serious plot in a wrestling game goes, we have seen some good and not-so good storylines in the past, but the Road to Wrestlemania mode with WWE ’12 is just flat out sloppy. It’s not that the writing is terrible, as a lot of the scenarios feel very true to the real thing. This mode’s downfall comes down to execution. You see, each of the three participants of this mode are given just six months to tell one full story. Sheamus’ arc is about the rise of a new faction, Triple H wants to be WWE Champion yet again, and Jacob Cass is a rookie who runs into some “Classic” competition. Again, there is a lot of meat to these narratives, but going four hours with each persona in the same storyline becomes a tiresome road to travel on. Players will fight backstage, in the ring, and see a good number of opponent changes, but everyone of these plots fall apart before finishing as unlike the television product, there isn’t much continuity. If the story wasn’t jumbled enough, the matches within Road to Wrestlemania have been replaced themselves with a new objective based formula. These play out like matches, but instead of pinning or making an opponent tap out, the player just presses an action button to be taken straight to a cutscene. Sometimes I would have dominated heavily before hitting the action button, just to see my Superstar layed out in an instant due to the the cutscene that followed. This eliminates any feeling of completion or any safisfying finish and it’s almost as if Yuke’s pulled away the controller and said “NO! We’ll do it!”. With such a huge variety of match types in the game, it was also a bit saddening to constantly be thrown into 6-man tags and tag matches in general. This type of bout did not work well with the objective-based finales at all (imagine taking out a whole team, only to be destroyed by one of those Superstars after completing the objective), and led to a lot of line-ups being a near mirror-image of what was offered for the previous week. As far as gameplay goes, a lot has changed in WWE ’12. Instead of using the control stick to perform grapples, THQ and Yuke’s have went back to the old face-button formula. For example, on the Xbox 360 controller, the A button is used to grapple, irish-whipping can be done with the B button, X is used for strikes, and Y is used to perform special maneuvers. After refining the stick method for so long, it was a bit odd to see such a huge backtrack in terms of control, but it’s not too difficult to re-learn the basics in a short time. Blocking works nearly in the same manner that we seen in previous entries with the player having to tap the appropriate trigger, but the timing windows have been minimized. Thankfully, this does improve countering, as blocking a move is a lot more strategical and accuracy and timing must be used to turn a move into a reversal. Running, taunting, and all of the other controls have remained in tact for the most part, so those familiar with the Smackdown vs Raw series will feel right at home when it comes to beating down a foe in the vast amount of exhibition matches after forgetting all about that now unnecessary stick. The core system is still solid and enjoyable…that is until the new physics engine comes into the picture. One of the most promoted inclusions in WWE ’12 was the new “Predator Technology”. For those unfamiliar, this lets players now interrupt grapples and attack a wrestler who is in an animation. This tech also stops Superstars from teleporting to an appropriate spot to perform a maneuver so that the action looks and feels more realistic. While this addition was needed in the Smackdown vs Raw series, it was pulled off atrociously here. When you do interrupt a move, there is little to no hit detection and most of the time, both of the opponents attacked will just fall to the ground and land on their feet, like nothing ever happened. To make matters worse, glitches also rear their ugly heads while attacking an opponent in an animation. I have had several occasions where my wrestler would literally twist into a rival while performing a move, temporarily creating a polygonal pretzel. Yes, it can be a hilarious sight to see, but my laughs were usually met with a sigh as there isn’t any reason these intrusive glitches should be happening. Looking back, wrestling games other than the Smackdown series have incorporated the same physics as the Predator Technology and did so quite well. Even No Mercy for the Nintendo 64 allowed for animation interruptions, and sadly that method was executed in a more realistic and fluid manner than what we see in WWE ’12. Staying on the same topic, the teleporting was one issue that was fixed. No longer do Superstars float to a spot to perform their finisher, and when you do pull off that said move, the result still looks authentic. For some odd reason though, if you are playing as someone who had a location based finisher, their special move will then be changed to a small elbow to the face outside of the ring. When you battle all match to get the chance to pull off an ultimate attack, it’s quite disheartening to see such a light technique done to an opponent, and also out of character for a good number of personalities within the game.